The beautiful views of Bass Lake will serve as the perfect back drop for the first ever Bass Lake Hot Rod and Classic Car Show taking place August 24, with proceeds going to the Children's Museum of the Sierra. 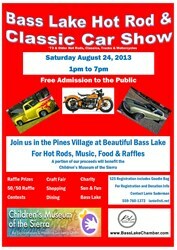 The innaugural Bass Lake Hot Rod and Classic Car Show takes place August 24 in The Pines Village. Beautiful views of Bass Lake and gorgeous cars, there’s not much more you can ask for that that. The Pines Village will be filled with classic cars, hot rods and more for an inaugural event taking place this weekend. The first ever Bass Lake Hot Rod and Classic Car Show takes place Saturday, August 24 from 1 to 7 pm. There will be dozens of drivable works of art on display throughout the Pines Village. “Beautiful views of Bass Lake and gorgeous cars, there’s not much more you can ask for than that,” said event chair Lanie Suderman who is putting the event on through the Bass Lake Area Chamber of Commerce. In addition to the cars, there will be prize drawings with a large selection of items up for grabs. “I’m really excited about how many of our local businesses put together some really amazing prize packages. They’ve been incredibly generous,” said Suderman. There will also be a petting zoo for kids in front of Century 21 Ditton Realty Bass Lake Vacation Rentals, and other kids activities provided by the Children’s Museum of the Sierra. Guests can also browse the numerous vendors that will be on hand as part of the popular Bass Lake Craft Faire show that takes place in the Pines Village several times throughout the year. The show will be running at the same time. The show will be accepting cars right on up to the start of the event. It costs $25 to enter a vehicle, with all proceeds going to benefit the Children’s Museum of the Sierra in Oakhurst. Admission is free. For more information, call 559-760-1372. Bass Lake is located in the Sierra National Forest about 20 minutes from the southern entrance to Yosemite National Park about less than an hour from Fresno. Once named by Sunset Magazine as One of The West's Best Lakes, Bass Lake is known for it's wealth of amenities and recreational opportunities on the water and just up from the shore's edge.